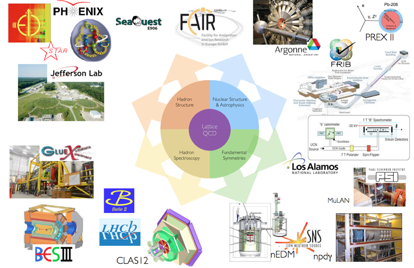 The Lattice QCD program in nuclear physics has grown significantly during the last several years. It is now an integral part of the overall nuclear physics research program in the United States and elsewhere, contributing and, in some cases, underpinning the experimental program, as highlighted in the figure below. Figure 1: Lattice QCD is an integral part of the nuclear physics research program in the United States, and elsewhere. At present the research thrusts that can be broadly classified under coldQCD and hotQCD. ColdQCD is an umbrella for investigations into the structure of hadrons, the spectroscopy of hadrons and the interactions between hadrons. HotQCD covers the behavior of matter under extreme conditions, such as systems at finite temperature and finite density. USQCD work supports, guides and complements the research programs of the experimental facilities. The recent Nuclear Physics Long Range Plan has the field spawning a significant program in fundamental symmetries along with re-orienting QCD-related research toward the gluonic structure of the nucleon and nuclei. Our research efforts are evolving to support these new foci. Important aspects of the Lattice QCD calculations in nuclear physics differ from those in particle physics. Spacetime volumes containing the quantum fluctuations of the gluon fields need to be larger to accommodate nuclei, operator structure need to be more comprehensive to distinguish between closely spaced multi-hadron energy levels and the number of quark contractions required to describe multi-nucleon systems is significantly greater than for a single hadron. Algorithms, software and workflows to handle these unique challenges continue to be pioneered by the USQCD collaboration. Exploring the spectra of baryon and meson states continues to reveal crucial information about the nature of matter. Our long-standing Lattice QCD program in this area is making remarkable progress. In addition, to precisely mapping out a significant number of states in spectra associated with experimentally-known quantum numbers, we have identified a number of exotic states corresponding to intrinsically gluonic excitations of matter, an example of which is shown in the figure below. 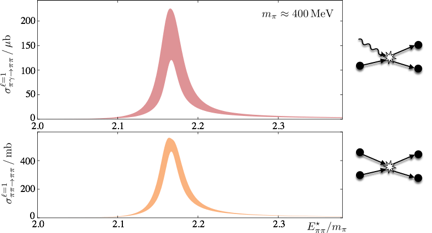 Figure 2: The meson excitation spectrum calculated at a pion mass of approximately 400 MeV, including exotic states that directly probe the gluonic sector (USQCD’s Hadron Spectrum Collaboration). The technology (algorithms and software) that has been developed for these purposes has recently been extended to explore resonances with precision and to provide first calculations of multi-hadron matrix elements required for the study of electroweak processes, see the figure below. Figure 3: The pion-pion scattering cross section in the channel containing the rho resonance (which is clearly visible) as calculated by USQCD’s Hadron Spectrum Collaboration. Also shown is the cross section for pion photo-production off the pion in this same channel. USQCD has a strong program in researching the structure of the mesons and baryons. This is currently focused on precisely determining properties of the nucleon, such as gA, parton distributions and generalized parton distributions, is charge, magnetic and axial radii, and its spin and mass decomposition. These are all quantities that directly impact the nuclear physics experimental program. As an example, and surprisingly, atomic experiments involving muons have shown that the proton charge radius is less well known that previously thought and that there is a significant discrepancy between electronic and muonic measurements, see the figure below. USQCD’s LHP Collaboration has been working to reduce the uncertainties in Lattice QCD calculations near the physical point to produce a purely theoretical value for the proton charge radius. Figure 4: The isoscalar charge radius of the proton determined by USQCD’s LHP Collaboration (2014). The properties and interactions of nuclei result from the complex low-energy dynamics of quarks and gluons that emerge from the spontaneous breaking of the chiral symmetries and the confinement of color. Lattice QCD calculations are rapidly moving toward refining the modern-day chiral nuclear forces in a way that will complement results that are expected from the FRIB experimental program that will soon commence. Combined, they will enable the properties of nuclei to be greatly refined and the structure and properties of dense matter, such as found in explosive astrophysical environments, to be reliably determined. As an example, the figure below shows that the magnetic moments of the nuclei are very close to the sum of the contributions from the nucleons alone over a large range of pion masses, indicating the nuclear shell model is robust to modest changes to the light-quark masses. In the last year, the first calculation of an inelastic nuclear reaction, n+p → d+ γ, was accomplished. Figure 5: The magnetic moments of light nuclei calculated at a pion mass of approximately 800 MeV (blue bands) by USQCD’s NPLQCD collaboration. The dashed red lines correspond to the experimental values. USQCD has a long-standing program in fundamental symmetries in Lattice QCD, from calculations of the neutron electric dipole moment (edm) (indicative of the violation of time-reversal), to matrix elements of quark-bilinears in the nucleon required for analysis of precision experiments measuring properties of neutron beta-decay, through first calculations of hadronic parity violation, and axial properties of light nuclei (as part of preparing for planned double beta-decay experiments). One recent focus has been the determination of the contribution from light-quark edms to the edm of the neutron, as shown in the figure below. This work involves calculation nucleon matrix elements of the tensor quark bilinear, and the present precision is at the 10-percent level. Efforts are underway to systematically reduce the uncertainties in these calculations. Figure 6: The strength of quark electric dipole moment contributions to the neutron electric dipole moment, as calculated by USQCD’s PNDME collaboration.